All sauna glass walls and doors are made from custom made 8 mm tempered safety glass All edges are polished. Production time is about 12-15 working days. Calere Sauna Glass Walls and Doors gives your sauna design, light and quality. All doors are equipped with high quality handles. 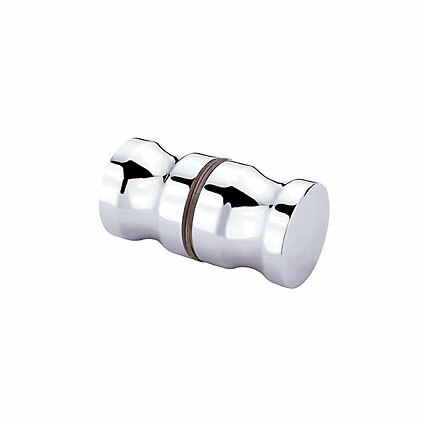 The knob door handle is a standard and you may also choose your own model from large range of handles. The full glass doors have high quality adjustable hinges with self-closing mechanism from 25° opening in both directions with an adjustable stop position ±15°. All hinges are equipped with special seal for sauna use without frames. Standard color for hinges, knob handle and glass clamps/fittings is chrome effect. You may have different colors when requested, myynti@sisustalasilla.fi . Choose the color of glass from warm bronze, smoky grey, modern clear or stylish clear/grey/bronze satin glass. Calere glass walls and doors have been specifically designed for sauna use. Glass increase brightness and impression of space in sauna and bathroom. They are also safer and make it easier for you to keep an eye on children from inside the sauna. The delivery doesn´t include other installation equipment’s. You may order special tape for aluminum lath/profile installation, HPX-tape and special sauna glass seal. Please see equipment´s for sauna installation. All pictures gives you impression of product and it´s color. Color is not real one but close. Please look through installation manual, measure instruction and care.